Fly newbie thinking of buying a 2007 Deluxe - tips and price advice please? Q: I know it's asked a lot, and I realize the market determines the price, but would you please give your opinion on a reasonable purchase price might be? He's asking $3000, which is definitely high. I've looked at ebay completed purchases, reverb ones too, along with a few at GC. The older ones seem to be less, and of course condition makes a difference (as does hard case vs bag), but the asking prices seem to range from ~1600 on up to ~2400, with most being around the 2K mark. Q: What should I look for when inspecting it? I can think of: Loose or bad frets, dings/marks, straight neck, scratchy switches/pots/jack. Maybe open up the back and look for ...? Also, I read somewhere that I should ask about extra springs (?) Any Parker-isms in particular? Thanks! I'm excited to try it out. Re: Fly newbie thinking of buying a 2007 Deluxe - tips and price advice please? Sounds like you have everything covered. I would make sure it has the spring that fits the size of strings you normally use. You can use a higher gauge spring, but not lower. 2k is the highest I'd go unless it's a rare finish. 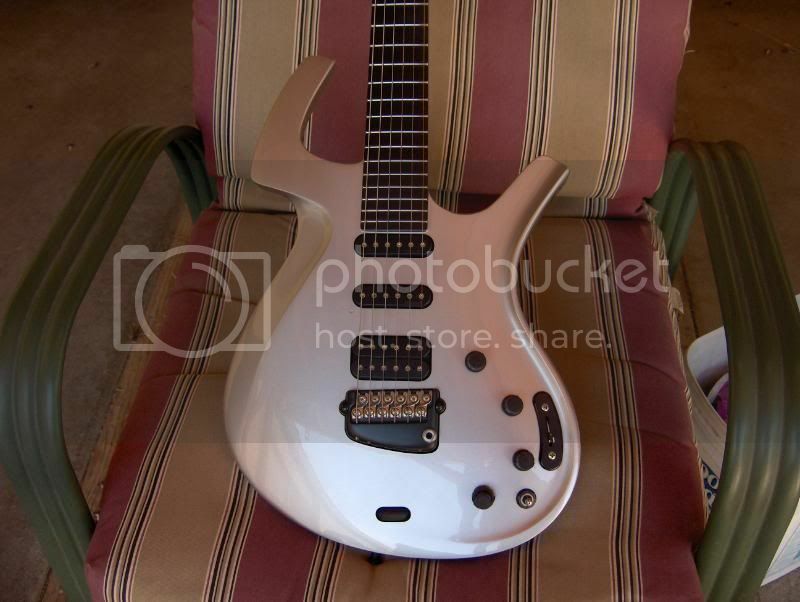 The refined guitars sell for more even though everyone claims to prefer pre-refined. If you do check in the control cavity, see if everything looks 'stock'. Ask specifically if the seller knows of any modifications. Make sure the mags and the piezos all work as expected. Check the edges of the fretboard. You don't want to see anything like a seam that could indicate it's not glued down properly. Check the position of the bridge in its cutout. You don't want it to be touching the wood in front, which could indicate that the support posts are leaning forward. Those two issues are fairly rare and can usually be addressed, but it would mean extra time and money on your part. Thanks a bunch you two! Hey - what springs did they come with - 9s and 10s, or were there more? ... what springs did they come with - 9s and 10s, or were there more? 9 was the factory standard. I've seen 8.5, 10, 11, and 12 as options. - It wouldn't hold a tune. It was low and every time I brought it up, it went out again. Maybe old strings, maybe the whammy settling in, but it did not give me confidence. Not sure what's going on. - The bridge pickup was too high, and the neck way too low. The bridge pu was tilted about 20 degrees. Adjusting height should be straightforward, but the angle worried me. - Two frets came unglued when it was removed from the case. Fortunately I noticed the problem and found them on the carpet. He said his tech would fix it, but I have reservations that someone not familiar with Flys would do a poor and temporary job. - The selector switches were bad. Toggling them a bunch of times helped. Maybe some contact spray would fix it, but maybe they need replacing. - The bridge pickup sounded midrange-y and muddy. The tone control was at 10. The neck (from what I could tell) sounded OK, as did the middle setting. I kinda' stopped looking for issues at that point. I forgot to try the coil split. I guess I was distracted by all the problems. Do you think these could all be addressed adequately by a non-Parker tech? Even if so, I'd be very hard pressed to pay $2K. Would you be wary about buying this particular instrument? Sounds like a good “project guitar”, but, when you consider that $1200 - 1500 and some patient eBay/Reverb-watching can get you a Fly in great condition, I would not consider $2k to be a good deal. If it were me, and it was an Artist, I’d offer maybe half of what he’s asking, but only because Artists are less common on the used marketplace than the Deluxe. If it’s a Deluxe in that condition, I’d be in the hundreds given the amount of work required. The frets, in my opinion, would be the biggest money pit/time sink. Electronics you can completely redo. The bridge, if you were tuning it in floating mode, seems like normal behavior; if it wasn’t floating, then that could be a different problem, but it was probably just in floating mode. I'm not sure what that means. An Artist model vs. Classic model? The serial number letter code should indicate which it is. Also, Artists are generally much paler in color than Classics. All strings dropped, or just one or two? The latter could just be strings unwinding at the ball end. That's not uncommon. Doesn't sound like a big deal. Hard to tell with something that's been sitting unused for years. There seems to be a lot of variation in the way people 'hear' pickups. Not sure what to say about that. Impossible to say for sure. It's a bit of a gamble, but so is almost every Fly bought through eBay or Reverb or whatever. I think I and many others here could deal with the issues, but I wouldn't want to spend two grand on a Classic needing the work. Frets coming unglued is the only thing that would have deterred me. Great points everyone! Re: "artist", I'm sorry to be confusing. I meant he got the guitar free from "artist relations" or whatever you call the company people who give out free equipment to promote themselves. It's definitely a Deluxe. Buy one that's in good condition vs this fixer. The seller wanting that much is a red flag. The value is severely reduced due to those conditions. Most techs don't know how to work on them so it's got be perfect. Frets don't fall off unless some cleaner, oil, etc. was used. I'd buy off Reverb where descriptions and returns are available. I purchased mine online and have enjoyed years of use. Sold off my other guitars. Parkers will out last other guitars. Their 95's can still be in perfect condition with years of use left in them. Depends on how they were cared for. My two cents say 97 or 98 in great shape and I would recommend a classic because the mahogany body vs the poplar found in the deluxe will be much warmer and rich were as the deluxe can sound a bit brittle. 2k isn't a good deal at all and I been through many Fly's until I found the best ones and I never had the issue were frets came off. I bought a brand new 08 US music Corp fly and it came to me with dead frets and the quality was subpar. They tried to turn Parker into a production guitar and started charging more and I assume to pay for all the CNC milling equipment and the consumer was the Guinea pig until they barely got it right. I would shop on Reeveb because most of them know what they have vs ebay you may be buying one that was from a liquidation of an estate etc. And the seller may not know a single thing about guitars. If the finish is trashed send it to Sharon at Shazrock ang she will make it brand new!